Monin Aniseed syrup in 70cl stylish glass bottle. Anise is an annual herb native of the Mediterranean region, identified by its distinctive, sweet liquorice-like flavour. It is one of the oldest known spices used for its aromatic, medicinal and magical qualities. In ancient times, anise was used to prevent nightmares and ward off the evil eye. Luckily, we have more flavourful uses for it today. People all over the world enjoy the flavour of anise in food and candies. It is a fragrant component of the French anisette liqueur but it is also delicious in coffees and teas. Mix Monin Anise with a little imagination and you will be surprised by the magically good liquorice taste of your drinks. Colour: Cloudy white with light yellow glints. Taste: Smell of pure star anise; refreshing, intense aniseed mouth filling with slight notes of liquorice. Sugar, water, natural anise flavouring, colouring agent: E161b, emulsifiers: acacia gum, ester gum. 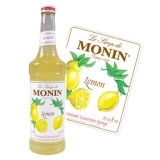 Sorry - We are out of stock of Monin Syrup - Aniseed (70cl).